Demand Action to Save Bees from Toxic Pesticides! 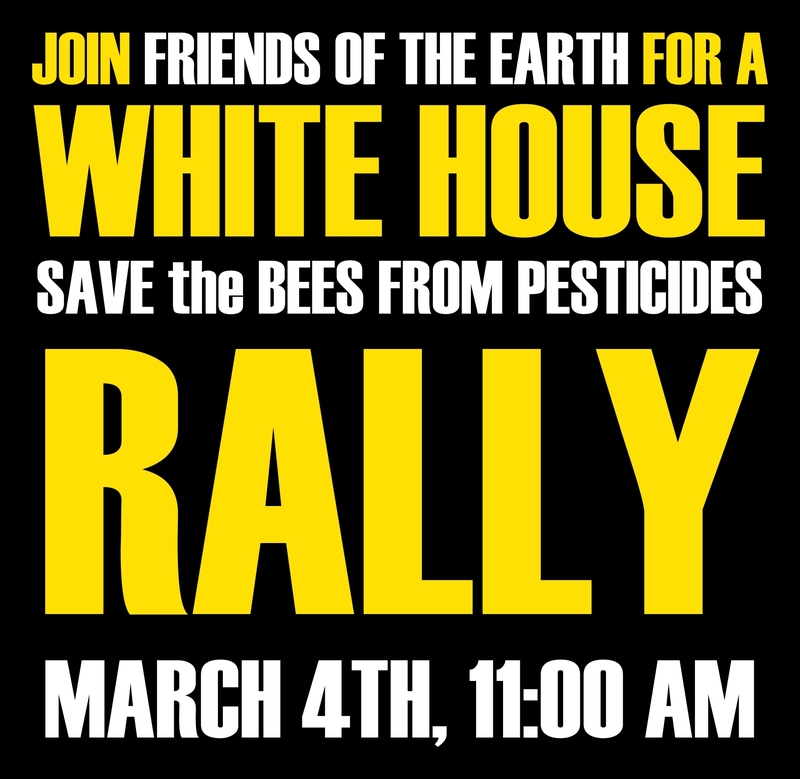 On March 4th at 11:00 AM, join Friends of the Earth, DCEN, and others, in front of the White House, and demand action to save bees from toxic pesticides. Directing the activities of the DC Environmental Network (DCEN) for a number of years has given me the opportunity to look at many different and distinct local, national and international issues of importance to sustaining life on earth. I often struggle when I ponder which of these issues are the most fundamentally important to the survival of our planet. I am no expert, but my gut tells me, time and again, that saving bees, both commercial and native species, is one of the big ones. Since childhood we have all learned how bees are a fundamental component of the complex system that ultimately is part of putting healthy food on our table each day. According to Save-Bees.org coalition, “Bees are facing many challenges, including habitat loss and pathogens, and pesticide exposure is of particular concern. A growing body of evidence, including dozens of peer-reviewed independent scientific studies, indicates that exposure to systemic insecticides, like neonicotinoids, are directly harming pollinators and causing poor bee health and severe population declines.” This is devastating to bees and our food system! Bees are currently threatened by the irresponsible, dangerous and ethically questionable activities of corporations like Bayer, Syngenta and other big chemical companies who manufacture the pesticides that are killing the District’s and planets bees. 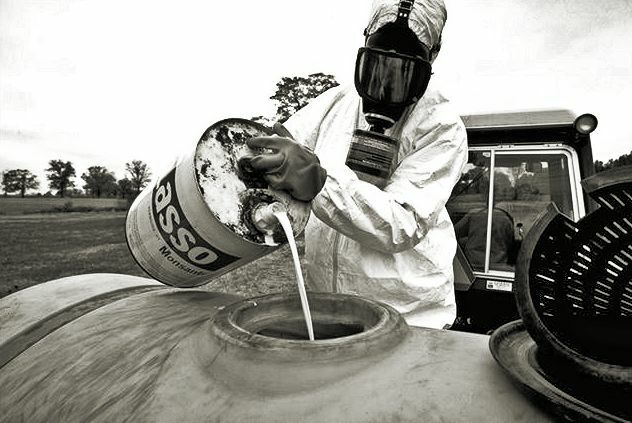 They are lobbying our government to NOT take action to reduce and eliminate the use of pesticides. President Obama has the power and responsibility to protect bees. Friends of the Earth, a founder of the DC Environmental Network, and longtime coalition partner in DCEN activities, is organizing a special rally to demand President Obama save bees from toxic pesticides. WHEN: Wednesday, March 4th at 11:00 AM. WHERE: Outside the White House on Pennsylvania Avenue, in front of Lafayette Square. RSVP here and DCEN will let Friends of the Earth know you are coming. Participants will help deliver 4 million petition signatures to the President, from people across the land, urging him to protect bees from bee-killing pesticides. Friends of the Earth will also choreograph a little street theatre with a rendition of “Ballet for the Bees” and the event will also feature speakers and signs. DCEN urges everyone to try and participate in this rally. You can come as you are or donned in your favorite bee costume. The bees we rely on in the District are threatened. 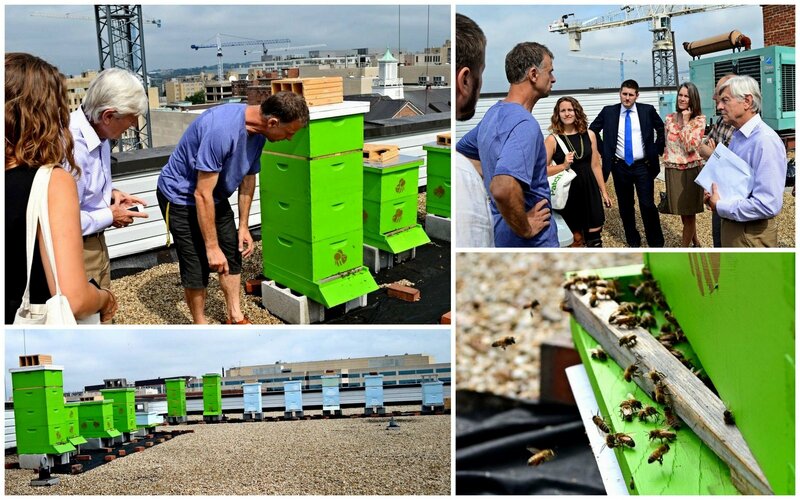 Here are some pictures of the DC Environmental Network, Global Green USA and Global Bees, touring a bee research facility at George Washington University, in Foggy Bottom, with impacted bee hives right in the middle of our city! Please consider joining us at the White House. This is a unique opportunity for local DCEN participants to engage on an issue with global significance and make a statement as global citizens in support of these special pollinators that are so critical to the food we eat. A Better Renewable Energy Vision for the District? 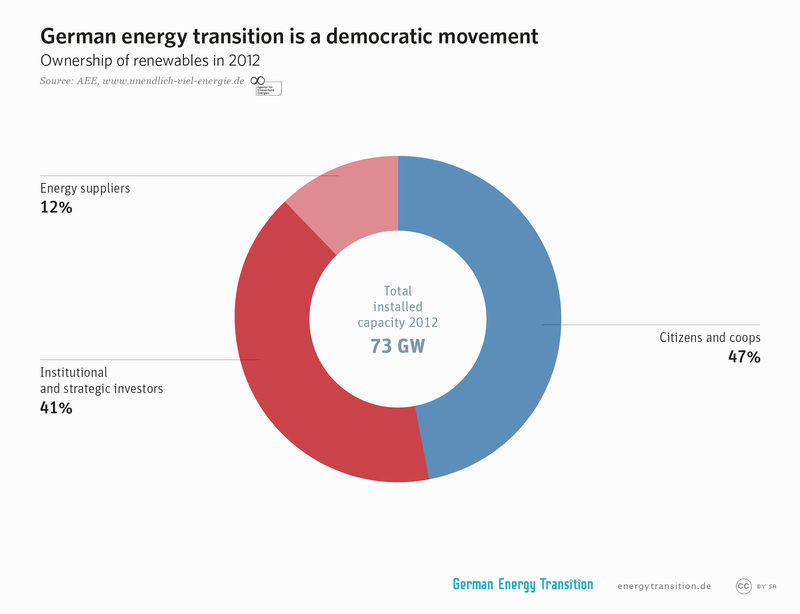 The German “Energiewende” (Energy Transition) and why clean, renewable energy, without nuclear power, is a good model for the District of Columbia and surrounding region. 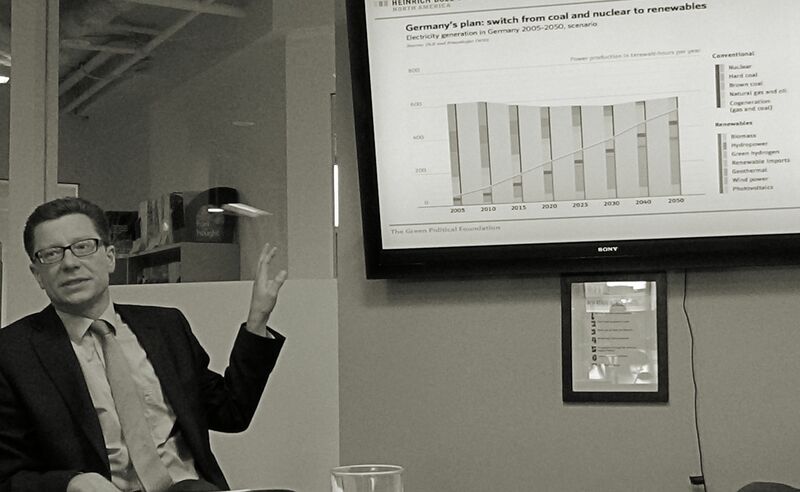 On February 5th,at our monthly networking meeting, the DC Environmental Network hosted an important discussion designed to highlight a powerful and successful effort in Germany, the Energiewende (energy transition), to generate 80% of electricity from clean, renewable sources by mid-century, and doing so while shutting down ALL of its nuclear power plants by 2022. This positive vision was presented as a possible alternative to the business model the nuclear energy utility, Exelon, is currently proposing for the District, Maryland and Delaware, in its bid to merge with Pepco. Our panelists were Paul Walker of Green Cross International and Bastian Hermisson of the Heinrich Böll Foundation North America. The discussion was moderated by Chris Weiss of the DC Environmental Network. The 47 participants included representatives from (partial) the Heinrich Böll Foundation, Global Green USA, Green Cross International, Friends of the Earth, Hispanic Access Foundation, Sierra Club, George Washington University, University of the District of Columbia, DC Statehood Green Party, Stanton Development, Scrap DC, Power DC, Natural Resources Defense Council, Georgetown University, District Department of the Environment, Young Voices for Climate Change, NetZero, Clean Grid Advisors, U.S. Postal Service (Office of Sustainability), American Association for the Advancement of Science, DC Smart Schools, Global Bees, National Research Defense Council, Climate Justice Support Group, DC Public Banking Center, Power Up Montgomery and staff of the DC Environmental Network. – PowerPoint Presentation of Bastian Hermisson, Heinrich Böll Foundation North America. 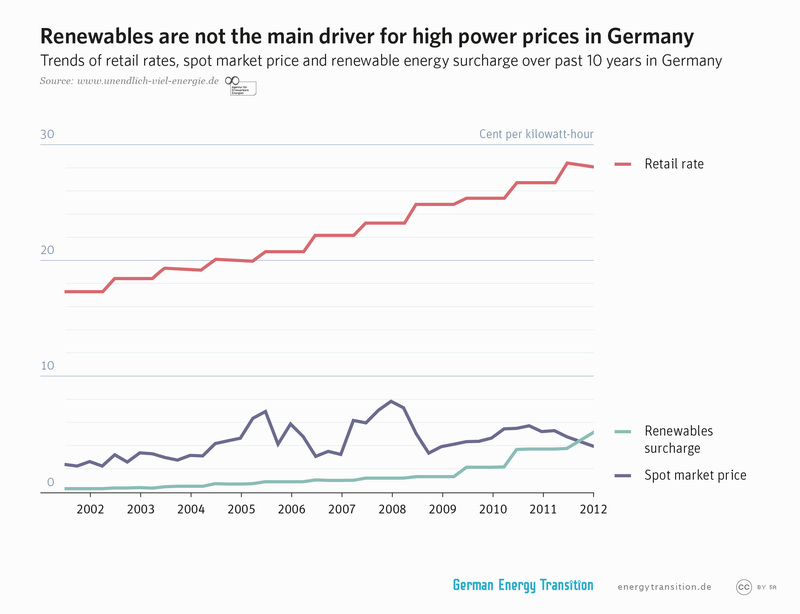 – Germany’s Energy Transition Website. – Every participant shared their name and affiliation and some announced upcoming activities of interest to the sustainability community. 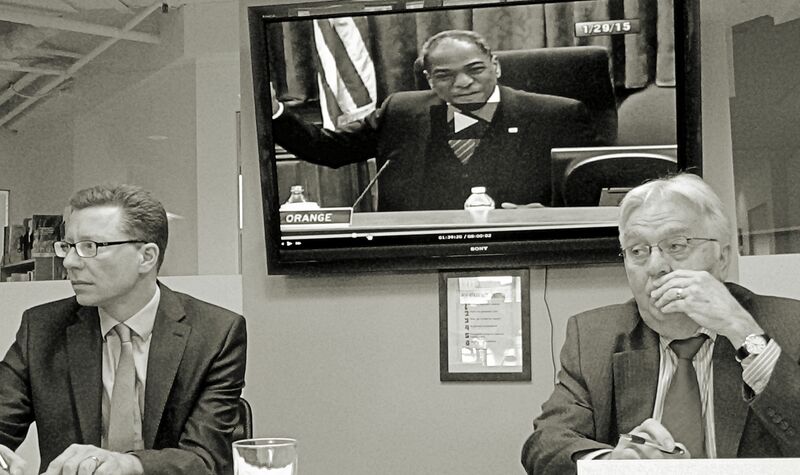 – Chris Weiss gave an update on efforts to stop the Pepco/Exelon merger which would bring higher energy costs for the poor, create problems for energy reliability and would damage ongoing efforts to bring more clean renewable energy to the District and region. – Chris urged participants to visit the Power DC website to submit testimony to the Public Service Commission (PSC) in opposition to the merger. – Construction costs are a key determinant of the final nuclear electricity generating costs and many projects are significantly over budget. Investment cost estimates have increased in the past decade or so from US$1,000 to around US$8,000 per installed kilowatt. The latter, record figure is for the two EPRs at Hinkley Point in the U.K.
– Construction cost estimates increased in virtually all countries, including China, Finland, France, and the United Arab Emirates. In the U.S., the builder of two units at the VC Summer site in South Carolina has asked for the seventh price increase since 2009 to meet rising costs. – In some countries (including France, Germany, the U.S., and Sweden), historically low inflation-adjusted operating costs—especially for major repairs—have escalated so rapidly that the average reactor’s operating cost is barely below, or even exceeds, the normal band of wholesale power prices. – Since 2008, Europe’s top ten utilities lost half of their €1 trillion (US$1.4 trillion) share value. A regional comparison shows Asian utilities have recovered little with their average share value still almost half of the 2008 value, European utilities still 30 percent down, while U.S. utilities are almost 30 percent above the level of five years ago even though total U.S. electricity use has been drifting down since 2007. – Bastian Hermisson shared how the Heinrich Böll Foundation has offices in over 30 countries around the world. – Bastian shared how understanding the European Union Climate and Energy Policy Goals help shape how individual countries, like Germany, move forward. – Bastian also focused on the dangers of nuclear power; Germany’s plan to shut down all of their reactors by 2022; Germany’s plan to switch from coal and nuclear to renewables; how power generation from fossil fuels is at a historic low; how renewables strengthen Germany’s energy security; how renewables help make economies healthy; showed it is possible to increase Gross Domestic Product (GDP) and decrease GHG emissions at the same time; demonstrated how renewables can create more jobs than conventional energy; shared how Feed-in Tariffs (FIT) work in Germany and grow renewables; explained how the German energy transition is a democratic movement and how energy co-operatives have increased in Germany; and presented how renewables have broad support in Germany. 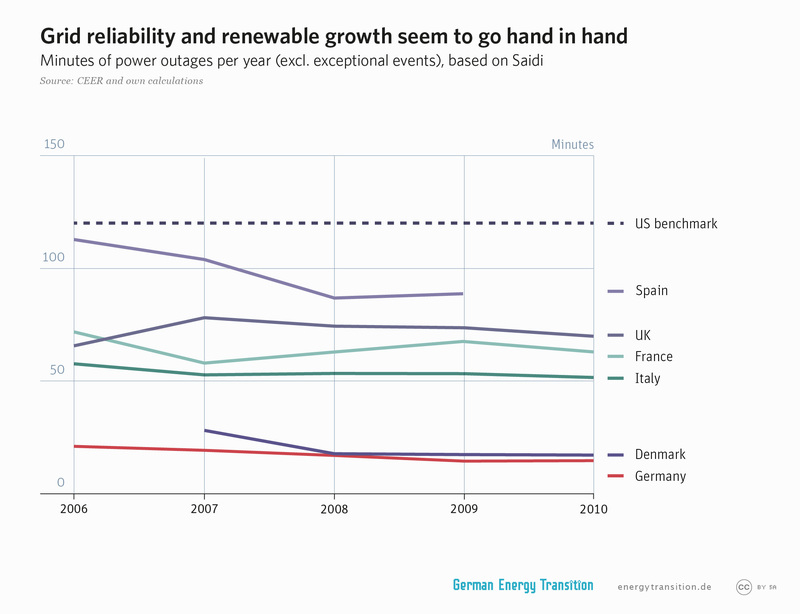 – Bastian explained how grid reliability and renewable growth go hand in hand; Renewables are not the main driver for high power prices; and how renewables need flexible backup, not baseload. – John Capozzi had the last word with another pitch about making sure everyone sends testimony to the Public Service Commission in opposition to the Exelon/Pepco merger. Go to PowerDC.org for more information! The next DCEN networking event will be on March 5th at NOON!